When Should You Pull Over Your Car? Most people beyond the age of sixteen understand how to operate the average vehicle. It’s as easy as opening the door, sliding into the cozy driver’s seat, turning the key in the ignition and putting the pedal to the metal. And yet, there are all too many of us who scowl at the very thought of driving a vehicle that is even a tad out of shape. But here’s the honest truth: There will likely come a day when you’re out on the road and an unexpected problem will present itself. These pesky issues have a way of coming at the worst of times, likely when we’re unprepared for them. What’s more, if you’re not ready on how to promptly handle these issues, things can get out of hand fast. Not only could these problems prove costly, they also have the potential to harm both your vehicle and yourself. Here is a quick list of reasons to immediately pull over the car. You’re cruising along, sun shining, windows down, and suddenly—BOOM-SNAP-CLAP-HISS. Now unless your car has tap shoes on its rubber soles, a jolting noise like this should be concerning. Unexpected noises could indicate any number of issues, ranging from the completely harmless to the rather severe. Perhaps you ran over a plastic bottle. Maybe your brakes are grinding and need to be replaced. There’s also a chance you busted your oil pan. Whatever the reason, find a place to safely pull off the road to investigate if the problem is worth addressing with a mechanic. A driver knows the tension and weight of their vehicle’s steering wheel. Some wheels are tough, requiring some arm strength to move in any one direction. Others are light as a feather, easily convinced by the twist of a wrist. If you notice a sudden or unfamiliar pull, tension, or tug in any direction on your wheel, however, it’s wise to pull off the road and assess the situation as soon as possible. Chances are the issue is related to the tires, power steering fluid or the wheel itself, but continuing to drive with uneasy steering is a potentially serious, life-threatening problem. A light wobble or tug can turn into a violent jolt in any random direction, and the last thing you need is to get in an accident simply because you delayed pulling over in time. Weather has a way of equally blessing and cursing us. Most of the time, the blue, clear skies and beaming sun safely guide all of us to our final destinations. Other times, monsoon or snow storm-like weather conditions plague us every moment we’re on the road. If at any moment you can’t see beyond fog, rain or a dewy windshield address the situation immediately. Though it’s tempting to handle it right away while you’re behind the wheel, your attention should always be on the road. Be safe, pull over, fix the problem, and move along. The temperature and oil indicators are not at all similar to a fuel indicator light. While some drivers manage to achieve miraculous mileage without running out of gas with this pesky light on, a vehicle’s temperature and oil are a drastically different story. These two dashboard lights are warnings of what’s to come if the problem is not handled promptly—both of which could lead to a failing engine. And when we say promptly, we mean immediately; driving with no oil pressure (or too high) or an overheated engine can cost thousands of dollars in damage. Even a quick trip home or a stop by the local mechanic with these lights on is not worth the risk and cost. Unless you’re planning a DIY facial or cook Chinese dumplings on your hood, allowing steam to puff and blow from your car is an issue. If you see steam rising from your hood, it’s a surefire indicator coolant is escaping from the cooling system. Little puffs of steam indicate a slow leak, while rising clouds indicate a fast leak; regardless of the size of the leak, it’s important to pull off the road and turn off the vehicle. Once you’ve pulled over, do not attempt to twist off the radiator cap with your bare hands. This little guy heats up to extreme temperatures and can easily leave a nasty burn. Use a rag or glove is available, otherwise, leave it to the experts to assess and correct this steamy situation. As the old adage goes, where there’s smoke there’s fire. And while it’s in our nature to quickly cue into these hazardous signs, there are a surprising number of people who will try to ignore issues like these when they’re on the road. Even if you see or smell a hint of smoke (or burning) coming from your vehicle, it’s better to be safe than sorry. Pull off the road and safely exit the vehicle. If your car is on fire, immediately contact 911 and put a safe, sizable distance between you and your vehicle. Since everyone isn’t born a savvy auto mechanic able to identify every car issue as it unfolds, it’s wise for drivers to have an idea of what to look for when it comes to trouble on the road. 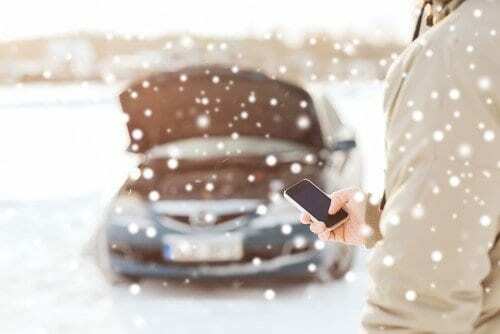 Lucky for you Colony One is here to help prevent many of these mishaps from occurring and give you the peace of mind to get where you’re going this winter safely. Schedule your appointment with us today!